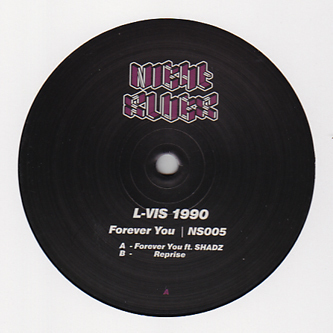 Juicy vinyl drop of L-Vis 1990's killer House riddim 'Forever You' and its dirtier 'Reprise'. Unlike his Night Slugs label co-owner Bok Bok's grimy productions, L-Vis strikes a seam of slick refinements with the title track, erring more to the Circle side of contemporary deep house with nods to DJ Gregory freshened with ecstasy-glowing synths. It's also a excellent vehicle for Shadz's redlit vocal, which really elevates this track beyond his peers. On the flip it's more of a soca-synched vibe with scattered sub pulses and a rugged swingjack flavour compatible with the likes of Ill Blu, XXXY and Geeneus, and primed for clubs from Abuja to Aberdeen. Heavyweight dancing material.